← Thank you to Terry Strickland for a great demo November 13th! The Holiday Show is underway! Here’s a list of featured artists! Come watch your favorite featured artist paint in the front window! (Some artists will be painting in their booth area as well.) 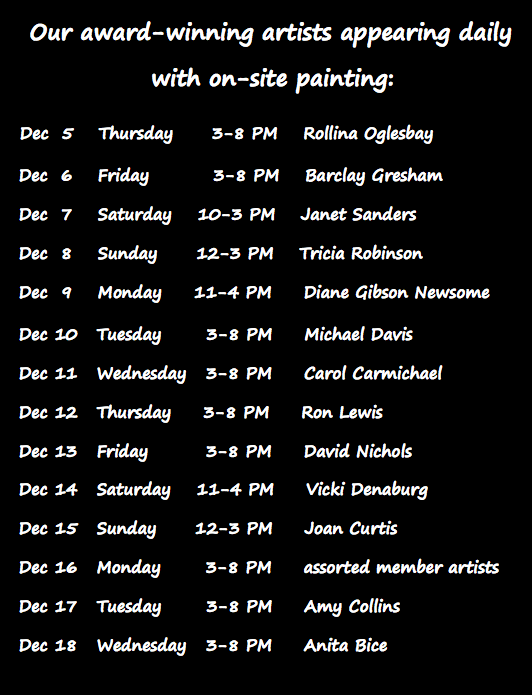 Note that December 16th is open, because we will have assorted artists painting all day. For more information, click HERE. Read featured artist bios HERE. This entry was posted in Announcements, Holiday Show and tagged brookwood mall, featured artists, Holiday show, Janet Tillery. Bookmark the permalink.